Meet Buddy, the latest addition to our little family. Isn't he the most adorable dog? Ever? He is SOOO soft and fluffy and such a good dog. You can tell he is a smarty and will train well. He tries to exert self-control all the time when we say no or tell him to sit or whatever. And he's just a sweetie. 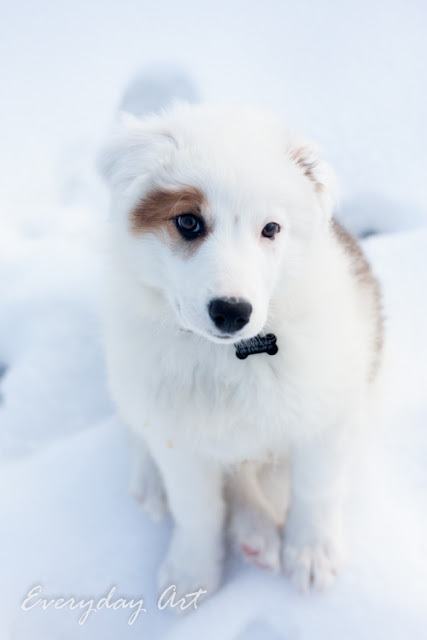 He is a Great Pyrenees/Border Collie mix, so he should be smart and good with the animals and kids. I'm hoping he'll be my running buddy. I also got a cute shot of our goats all lined up--they have these paths they walk on in perfect single-file. 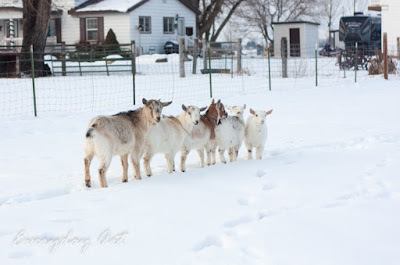 It make sense that they do this when the ground is covered in snow, but they did it in the summer too. 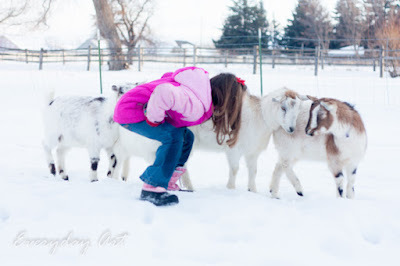 And here is my middle daughter, whom we sometimes call "The Goat Whisperer."